Distillers from Northern France can lay claim to the invention and development of calvados. In the 1700s cider distillation was limited to Brittany and Normandy in a bid to protect the grape brandy trade throughout the rest of France. 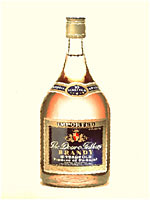 Normandy calvados is the most common variety to be served in bars in London. 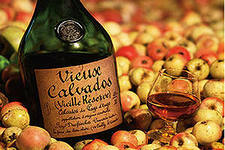 The best calvados comes from the Appellation Controllee Pays d'Auge, which backs onto the port of Deauville. The other ten areas are classified as Appellation Reglementee. Many calvados bottles share conventional brandy descriptions (such as VSOP and XO) to indicate the length of ageing. Roger Groult, Morin and Pere Magloire bear testament to how fine the best calvados can be. London bars which serve calvados are worth seeking out even if you have never appreciated the taste of cider. This more refined taste is bound to change your mind. In medium saucepan over medium heat, bring the chopped apple, water, and sugar to a simmer. Cover the pan, lower the heat slightly, and cook for about 15 minutes, until the apples are very tender. Remove from the heat and cool the mixture to room temperature. Add the lemon juice, lemon zest, and Calvados, and stir the mixture thoroughly. Chill it until very cold, for about 2 hours. Freeze in an ice cream maker according to the manufacturer's instructions.